You are probably wondering what a "multi-state icon" is. A multi-state icon is a visual that contains multiple variants of itself. Depending on the situation, a different variant or state can display. To display an icon, you call an instance of this movie clip use code to take you to the appropriate frame where the icon you wish to display resides. In this short tutorial, you will learn how to create your multi-state icon movie clip and generate the code needed to switch between each of the frames. Let's get started! 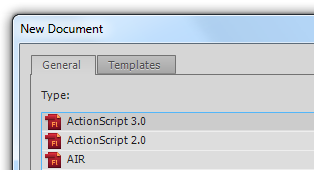 Launch any version of Flash that supports ActionScript 3 based projects. I will be using Flash CS5.5, but the instructions should be similar on older versions as well. After you have created your project, you will see a blank design surface where you can start to create things. We won't do anything here...just yet. 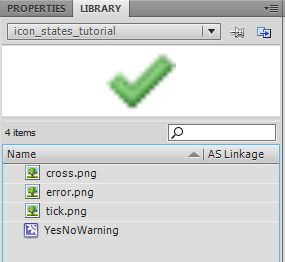 In the Create New Symbol dialog, find the Name field and replace Symbol 1 with YesNoCancel. This will become the name of your movie clip. Once you you have entered that name, press OK to close this dialog and create your new symbol. Right now, you will be inside your YesNoWarning movie clip that you created just a few seconds ago. It is here where we you will start populating the various frames that will make up the states of our icon. Frame 1 is now done, and you have just created the first state of your multi-state icon! Let's add the next state. Because each state corresponds to a frame, we need to insert a new frame for the new icon we wish to display. In your timeline, right click on Frame 2 and select Insert Blank Keyframe. Notice that when your blank keyframe on Frame 2 is selected, your design surface is empty because there is nothing to show. Let's change that. We are almost done with the movie clip! Let's make sure the icons display properly. Scrub through your timeline by dragging the red timeline marker back and forth between Frame 1 and Frame 3. 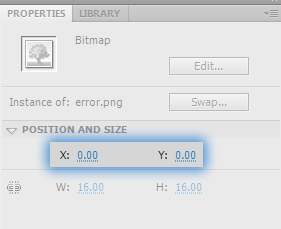 While you are scrubbing, make sure your icons are displaying in the same location and not jumping a few pixels each frame. 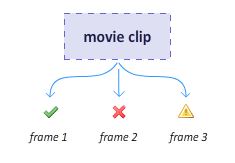 Right now, the frames in your movie clip will play in a continuous loop because...well, that is what frames in a movie clip do. 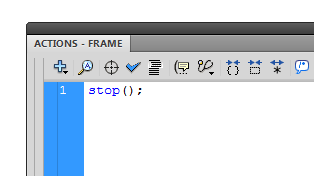 The way you stop the frames from playing is by adding a stop() action to the first frame. You should be back to your main stage...which is completely empty. Let's change that next. You will see your YesNoWarning movie clip listed. Select the movie clip and drag/drop it onto your design surface. An instance of this movie clip will now be created for you. 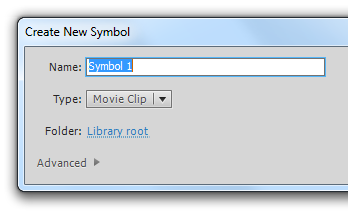 With your movie clip named, you can now refer to it easily using code! In your timeline, right-click on the first (and only keyframe) and select Actions. The Actions dialog will appear again. The reason is because the gotoAndStop function takes the frame number of the movie clip you are calling it on as an argument. Depending on the frame number you pass to it, it goes to and stops at that specified frame. In our case, the frame number 2 was specified as the argument to our gotoAndStop function, and that frame number corresponds to the cross icon. You can pass in either a 1 or a 3 to get the checkmark and warning icon respectively. Wohoo - and now you are done! You can see a practical application of this in the Detecting What is Supported tutorial where I use a variant of this multi-state icon. That's all there is to it. In this tutorial you learned a little bit about how to reconcile the world of the timeline with ActionScript to create something quite interesting...such as a multi-state icon.